Taking high-powered estate cars to the next level, the new RS6 is even more powerful than Audi's R8 super-car. Combining the most potent engine that the company has ever produced for a production car with a four-wheel drive transmission and the practicality of an executive estate, the RS6 attempts to blend high performance with work-a-day functionality. The one-upmanship between the German premium manufacturers has meant that more and more powerful engines have been appearing in their family saloons and estates with predictable regularity. The increasingly high outputs of the engines have encouraged the manufacturers to increase the capabilities of their model's chassis and transmissions, developments that in turn benefit the rest of their ranges. 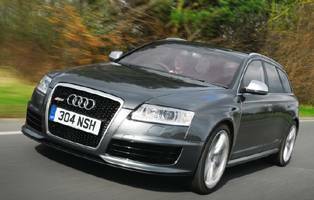 The previous generation RS6 used a twin turbo V8 engine producing 444bhp, later increased to 473bhp. 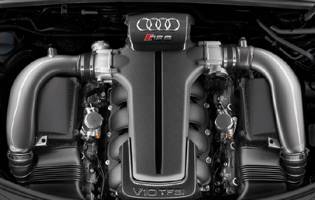 The new model's twin turbo V10 is nearly 100bhp more powerful, making the RS6 the most powerful production estate car available at launch. Audi's highly advanced Quattro four-wheel drive system gives it the edge over rivals in terms of power delivery, but for a more sporting drive the transmission has been re-developed to deliver 60 per cent of the engine's tremendous power to the rear wheels, unlike the 50/50 set-up of the previous generation model. Despite its super-car performance, Audi has attempted to design the RS6 so that none of the practicality and tractability of the A6 models is lost. The large and luxurious interior remains intact, as does the copious boot. Adjustable suspension means the RS6 needn't always offer a harsher, performance-orientated ride. Fuel consumption has been minimised too, although it still reflects the high-output nature of the engine. As the range's flagship model, the RS6 has most of the options boxes ticked, but Audi is aware that the exclusive nature of the performance model means customers are likely to want a bespoke build, with additional options and specific colour choices. From the outside, there's little to give away the model's unbelievable performance credentials save for slightly bolder arches, larger air intakes, twin exhausts, large wheels and brakes and, of course, the RS6 badging. The discreet styling is in keeping with Audi's reserved philosophy. An outstanding performance vehicle, the RS6 is not for the faint-hearted if driven with venom, but little of the A6's tractability has been sacrificed. 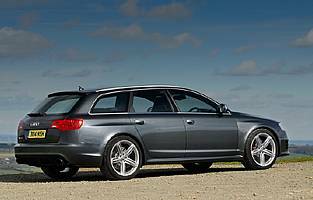 It comes with the same expensive running costs as a high-performance sports car and doesn't quite muster the soul of some of its rear-wheel drive counterparts, but if money is of no concern then the RS6 is one of the most exciting and smile inducing estate cars money can buy.